Great looking watch. Nice orange face that compliments so many colors. Fashionable band with up to date look. So many features. Exceptional value. You can't go wrong with this bold men's watch from August Steiner. This handsome timepiece features a colored dial displaying the day, date and dual time zone subdials. 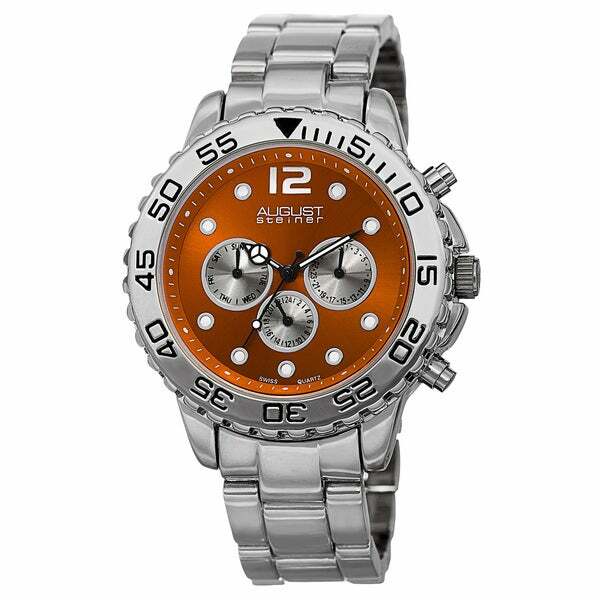 With a reliable Swiss Quartz movement, this watch is sure to enhance your wardrobe. I get compliments on the watch all the time. Love it. I bought it because orange is the color of my company's logo, so I have a bunch of orange swag. I was very impressed with the quality and style, very elegant. the price is wonderful. Compared to other retailers the price is great. Received it in perfect condition due to expert packaging. Received so many complaints since I got it. I highly recommend this watch for its beauty, quality and price. Thank you for a wonderful watch.